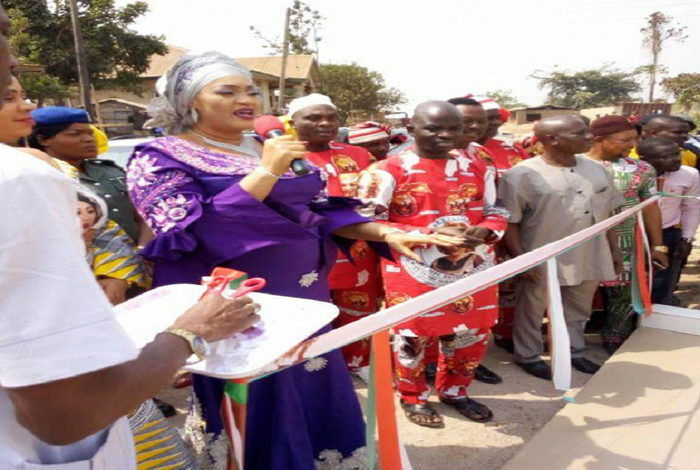 The wife of the Ebonyi State governor, Mrs. Rachel Umahi has commissioned some facilities meant to improve the living standards of the people of Afikpo South otherwise known as Edda land. The commissioning was part of activities lined up during a one day visit of the governor’s wife to the local government area. Speaking shortly after the commissioning, the wife of the governor said that the projects would impact positively on the lives of both women and youths in the area and give a face-lift to the Council area. Mrs. Umahi pointed out that the vision of the present administration is not only to improve the living standard of the people but also speed up infrastructural development of Afikpo south LGA and the state at large. She commended the people of the council area for their unfettered commitment and support to the progress of the Governor David Umahi-led administration and expressed optimism that agenda of the present administration would benefit the people of the area. Mrs Umahi enjoined the people to continue to be peaceful stressing that meaningful development can thrive in n atmosphere of rancour and violence. Mrs Umahi later attended a rally in the Council where she inaugurated the Rachel Umahi for Akubaraoha 2019 Organization. Meanwhile over 10,000 women from the 11 autonomous communities of Edda clan in Afikpo South Local Government Area of Ebonyi state at a rally unanimously adopted the state Governor, Chief David Umahi for a second term in office. The women in doing this cited his numerous achievement in the area of infrastructure and human, capital development in the state in the last 2 and half years. The women who took the decision at the Egbebu Primary school, Ekoli Edda in Afikpo South LGA during the Rachel Umahi Women for Akubaraoha 2019 solidarity rally stated that the Governor has since assumption of office has transformed the state capital and the 13 local government areas in the state. Some of the women who took their turn to eulogise the achievement of the Governor said that they have commenced the mobilization and sensitization of every woman within the voting age who is yet to register and collect her voters card to immediately do so to enable them vote massively for the People’s Democratic Party in the state. A woman activist in the state who was also the former Head of Service under the administration of Chief Martin Elechi, Mrs. Ugo Nnachi while enumerating the achievements of Governor David Umahi stated that in 2019, no one from the clan would summon the courage to come out to contest against the governor as he has achieved many of the yearnings and aspiration of the people of the community. Mrs. Nnachi listed some of the achievement of the Governor to include construction of minimum of twenty kilometers rigid concrete paved roads in each of the 13 local government areas, provision of street lights in Abakaliki Capital Territory and all the 13 local government areas, completion of Ebonyi State School of Nursing Uburu and the completion of the construction of Amangwu Edda twin bridges among others.